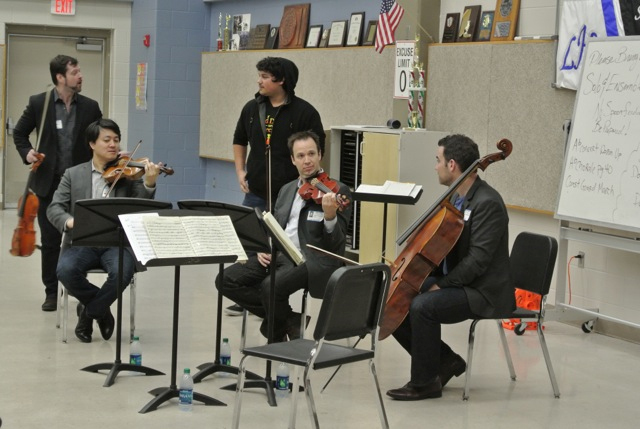 Following an unusual performance (the audience got to vote on some of the pieces performed) on the SACMS formal series, the Miro Quartet gave a stimulating outreach concert for orchestra students at Lanier High School. Orchestra Director Ruben Zepeda brought some of his string students from Tafolla Middle School. Individual students were asked to identify the instrument in the quartet that had the melody at any given time. 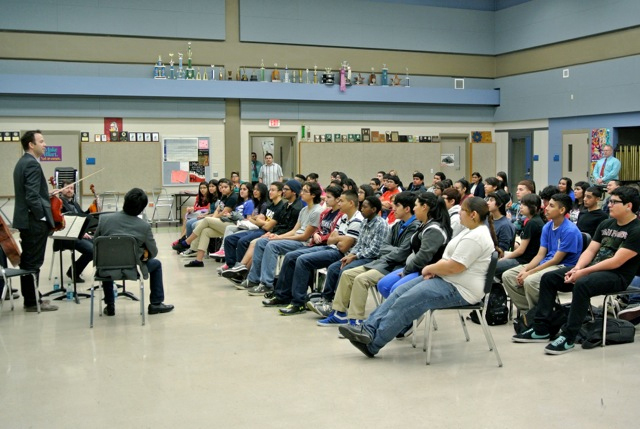 During a Q&A session, Mr. Zepeda asked about practicing. The Miro agreed that private practice is a necessary part of excelling in music and that it is better to do a little every day rather than cramming into one lesson. The outreach finale (which had ended the formal series concert on Sunday) was the enthusiastically received Orange Blossom Special.